In this paper I make a preliminary sketch of the field of psychoanalytic psychosocial practice. I do this by looking in detail at four accounts of clinical work which claim to be psychosocial. I start by describing one vector of this field which I use to distinguish between the clinical accounts, whether they believe a psychoanalytic psychosocial practice can be done within the existing psychoanalytic framework, or whether a more radical clinical approach is needed which would fundamentally change the way psychoanalysis is practised. 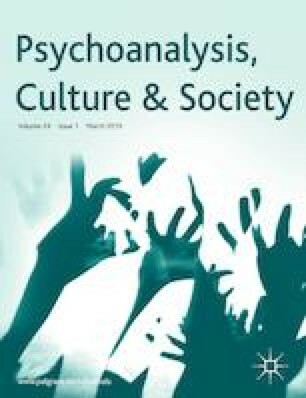 In exploring this vector in more detail, other differences between the authors of these clinical accounts emerge: how they understand the connection between psychic and social reality; how they understand neutrality, transference and countertransference; and how they conceive of the aims of psychoanalysis. Further elaboration of the different ways of understanding these elements and their connection with each other would be needed in order to take further this preliminary mapping exercise. British Association of Counselling and Psychotherapy (2017) Ethical framework. https://www.bacp.co.uk/events-and-resources/ethics-and-standards/ethical-framework-for-the-counselling-professions/, accessed 11 June 2018.